At DC-Supply, we offer flat rack containers in standard ISO 20 or 40 foot sizes with CSC authentication. These types of containers are particularly suitable for oversized goods, as they are fitted with gables and therefore can easily be loaded and unloaded from the top and from the sides. Flat rack containers are available both with fixed gables and with collapsible gables. With sloping gates, the container can thus act as a platform when the load requires it, which gives great flexibility in relation to the dimensions of the goods. 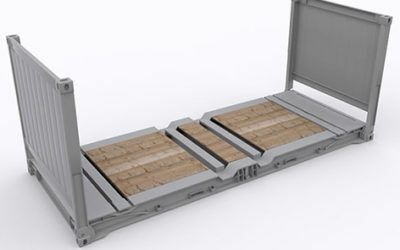 With a flat rack container, you will then be able to customise your container solution to a specific need, as it can work both as a platform but also as a closed container. A flat rack container can be delivered in several colours, and new containers can also be delivered with your company’s own logo. Remember, we always offer the opportunity to buy and rent containers. At DC-Supply A / S, we always offer high quality advice and guidance in connection with your choice of container solution, and we take pride in understanding and meeting customer needs. Contact us for a talk about your unique situation and we will find the best solution together.